ESP-WROVER-KIT targets the high performance requirements with 4.5 MB of RAM and a dual core 240 MHz CPU. Create Internet cameras, smart displays or Internet radios with this highly integrated ultra low power module by connecting LCDs, cameras, microphones and codecs to it. Have fun! 1.2.4 GHz Wi-Fi & BT/BLE Development Board compatible with ESP32 modules, ESP-WROOM-32 and ESP32-WROVER. Supports an LCD and MicroSD card. 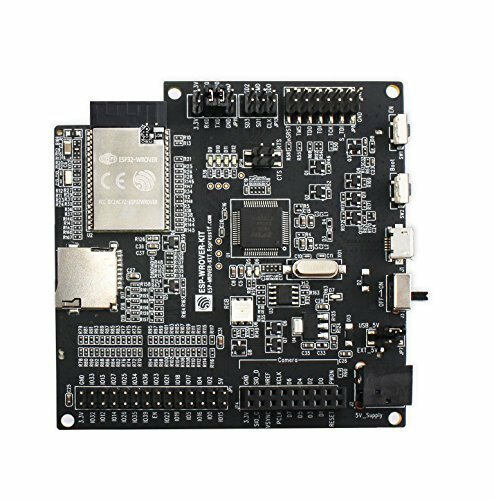 2.ESP-WROVER-KIT is Espressif's versatile development board. With a rich list of features, such as on-board LCD, JTAG, camera header, RGB LEDs, etc., it is ready to accommodate different modules: either ESP32-WROVER or ESP-WROOM-32. Several pin headers and jumpers make the connectivity and configuration of our ESP-WROVER-KIT highly flexible. If you have any questions about this product by Espressif, contact us by completing and submitting the form below. If you are looking for a specif part number, please include it with your message.